Δ Tanya Tagaq. Poslech alba Animism je jako úkryt v krku vlka během lovu — fascinující, vzrušující zážitek. Jsem v úžasu ze zvuků, které pocházejí z hrdla této krásné kanadské Inuitské dámy — mocný a jednoduchý příklad lidského hlasu jako nástroje. Je tu něco znepokojujícího a okouzlujícího zároveň, hrdelní vrčení přes anestetikum, rafinovaně instrumentální —, které také dokáže odhalit více vrstev v průběhu skladby. Zejména “Flight” je ohromující. Stojí za poslech! Δ Notes: The album is a shortlisted nominee for the 2014 Polaris Music Prize, her first nomination for that award. The album won the $30,000 award on September 22, 2014. Δ For those unable to experience experimental Inuk artist Tanya Tagaq’s sonic contribution to National Maritime Museum’s “Polar Worlds” exhibit in situ in London, UK, Tagaq announces the work will be released as a digital EP titled Toothsayer via Six Shooter Records. Toothsayer, a 5~track soundscape created for the exhibit, expands Tagaq’s prestigious compositional work with ambient electronic and piano~driven textures. 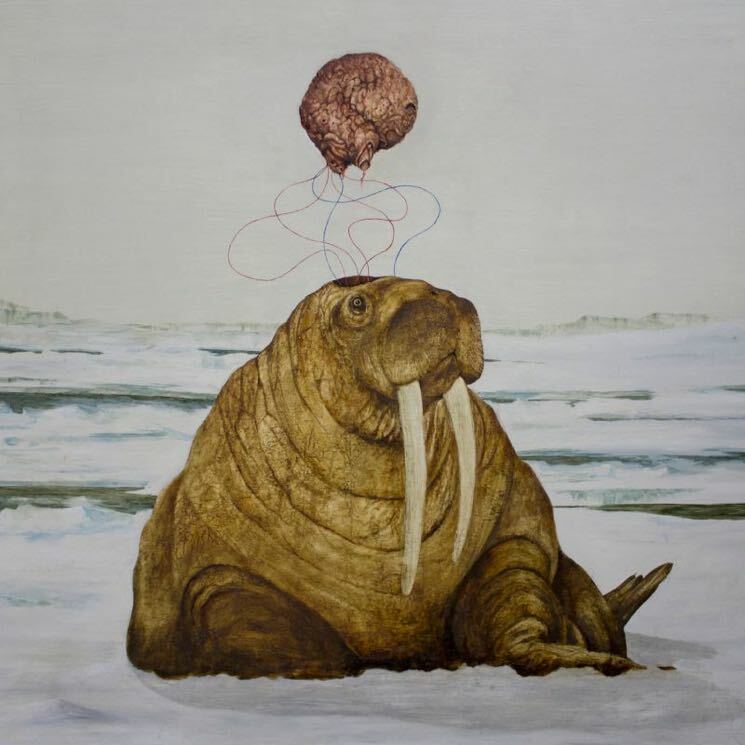 Δ Organized as a categorical assessment of the different and extreme elements of the Nunavut winter, where “it’s so easy to succumb to death in the north purely by the elements, including the socio and political elements,” the EP also connects in title and theme with Split Tooth, Tagaq’s debut novel. The book, a powerfully permeative mythobiography about a girl growing up in Nunavut in the 1970s, was released in September 2018 and immediately found a place on the Giller Prize Long List, Canada’s top fiction prize. The work also appeared on year end Best Of lists including NPR, Globe and Mail, CBC, Toronto Star and more. Apple Music named the work Canada’s Best Canadian Audiobook; narrated by Tagaq with improvised vocal elements, Split Tooth’s fact~fiction~dreamscapes come alive in this spoken word form, which moves between silky hypnotic poetry and carotid~ripping song. Toothsayer travels a similar path to Split Tooth through poles of exquisite delicacy, frenzy and fury. Δ The collection originated as a sonic contribution to the National Maritime Museum’s “Polar Worlds” exhibit in London, U.K., but for those who couldn't experience it in person, the five~song set will be released as a digital EP. Δ “I named this Toothsayer because I always liked the term soothsayer, to look into the future and to speak wisely,” Tagaq said in a statement. “Teeth represent protection and hunting in nature. Δ The compositions deal with the challenges of surviving the harsh winters in the Canadian territory of Nunavut. Tagaq goes on to say, “it’s so easy to succumb to death in the north purely by the elements, including the socio and political elements.” The music also explores similar themes that Tagaq explored in her 2018 acclaimed debut novel, Split Tooth. Δ Tagaq has long been a vital voice for speaking out on behalf of indigenous issues. She continues to use her platform to increase awareness of a culture that is historically overlooked and marginalized.